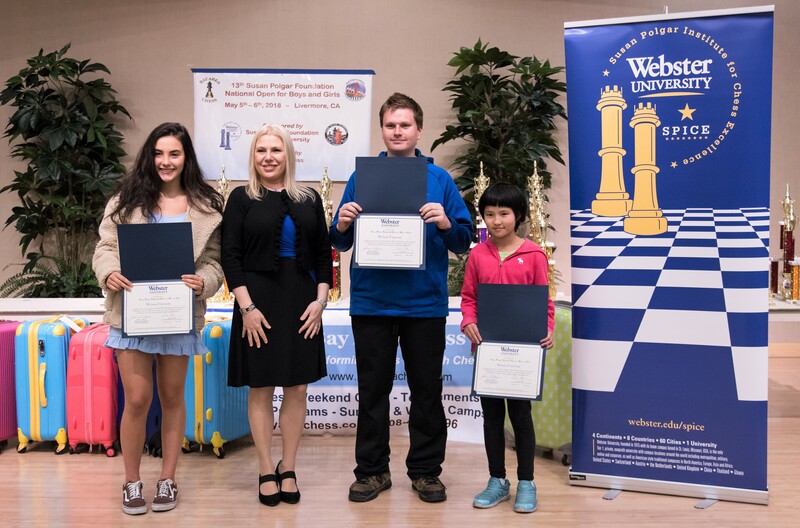 The Susan Polgar Foundation National Open held on May 5-6 again attracted a large, strong field from the Bay Area and the West Coast, including several dozen players ranked in the top 100 in the country in their age categories. They included the number one 10-year-old boy and girl in the U.S., CM (USCF Candidate Master) Eric Yuhan Li and Rui Yang Yan; the 8th-ranked 11-year-old, CM Vyom Vidyarthi; the 20th-ranked 17-year-old, FM (FIDE Master) Ezra Paul Chambers; the 13th-ranked 11-year-old girl, Yesun Lee; the 21st-ranked 15-year-old girl, Andrea Botez; the 12th-ranked 9-year-old, Shawnak Shivakumar; the 4th-ranked 8-year-old girl, Omya Vidyarthi; the 5th-ranked 9-year-old girl, Anika Rajaram; the 9th-ranked 7-year-old, Rohan Rajaram; and many others. 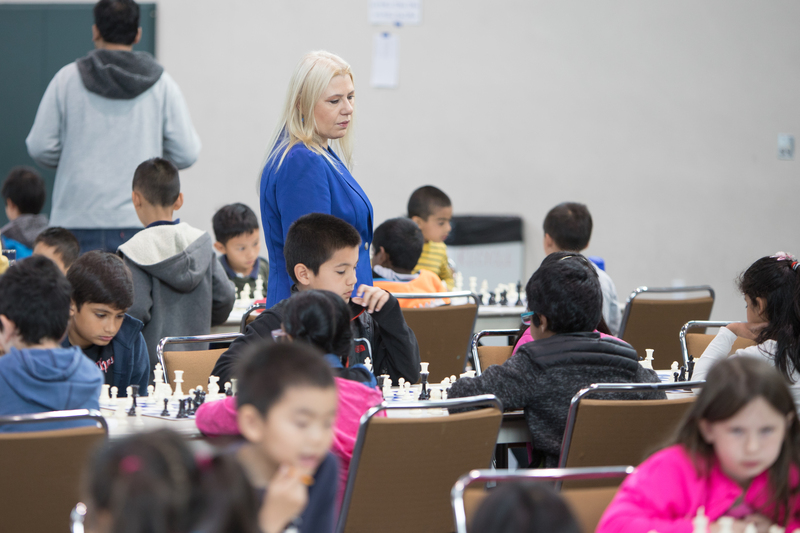 All told, 348 players competed in the tournament, which was in its third straight year in Northern California, and its second straight year at the Robert Livermore Community Center in Livermore. There were 10 age-based championship sections, along with two one-day sections for the K-8 Under 800 and K-4 Under 500 rated players. 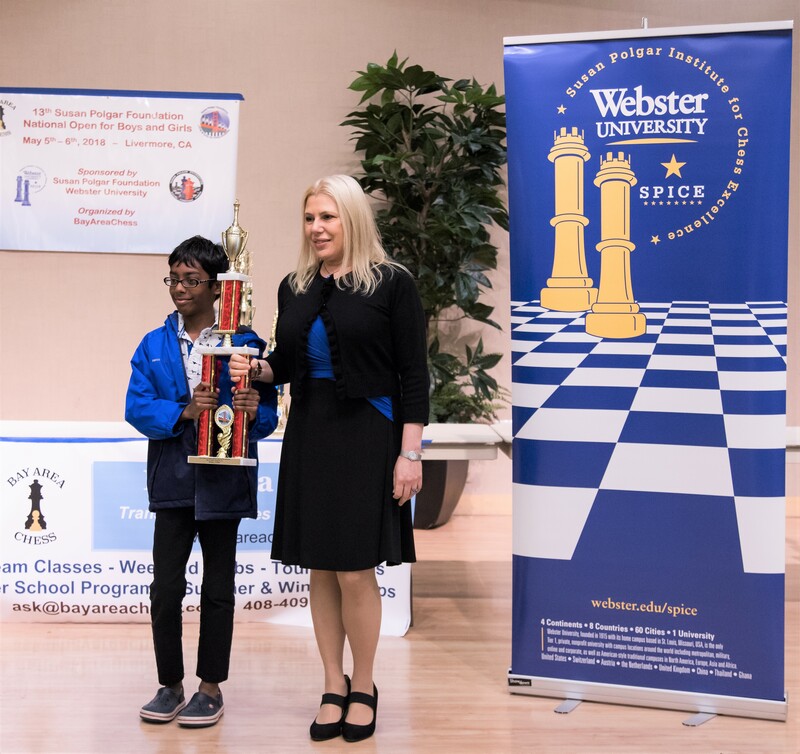 Top prizes were $48,000 scholarships for the winners of the Under 16-18 Boys and Girls sections worth to attend Webster University in St. Louis, the university with the strongest chess team in the country and coached by the tournament’s namesake, GM Susan Polgar. 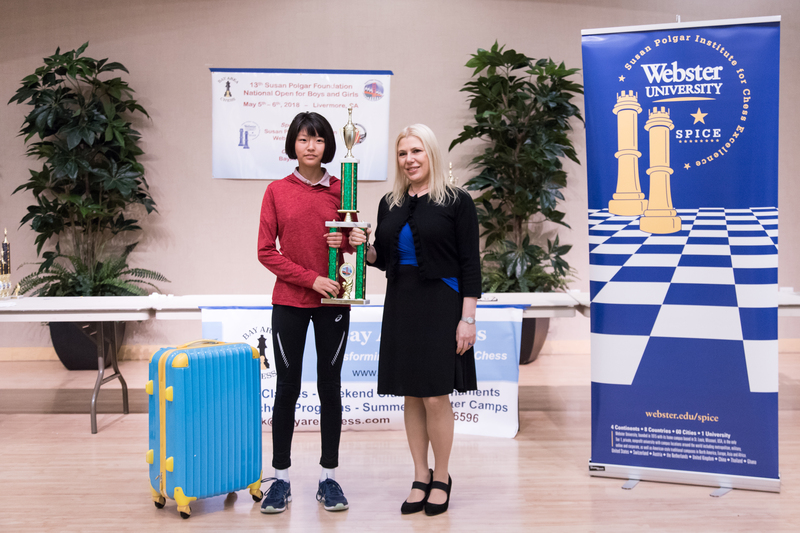 The first place winners in each of the girls’ sections also qualified to play in the Susan Polgar Foundation Girls’ Invitational Tournament. He cited his first-round victory over second-place finisher Arun Dixit as the highlight. 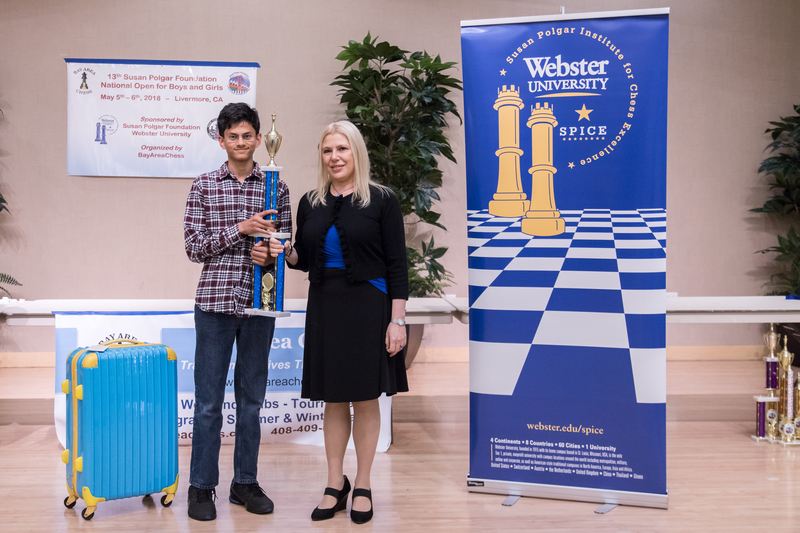 The 11th-grader said he is “very seriously thinking” about attending Webster, whose Polgar-coached chess team includes 8 GMs, 2 IMs, and numerous other strong players. Similarly, favorite Rui Yang Yan (above, right) won the Under 16/18 Girls section with an unblemished 6-0 record, beating 2nd-place finisher Andrea Botez twice. Since Yan is not yet in high school, the tournament sponsors decided to offer the scholarship to Webster to both Rui Yan and to the top high-school finisher, Botez (above, left). Altogether, Webster awarded a total of $150,000 in scholarships to Botez, Chambers and Yan. In the Under 14 Boys, Kunal Shrivastav (above) of Redwood Middle School pulled a minor upset by finishing 5-1, ahead of a pile-up of 5 players with 4.5 points, including pre-tournament favorites Daniel Cheng and Evan Zihao Ai, and 3 others, Felix Yipeng Liu, Matt Bhattacharya, and Anshul Govindu. Meanwhile, Agnes Zhiyi Wang (below), the 30th-ranked 13-year-old girl in the country, won the Under 14 Girls. The largest championship was the Under 12 Boys, which featured 45 players. Aghila Nachiappan (below) of Mission San Jose Elementary successfully warmed up for the National Elementary tournament this weekend by taking first on both tiebreak and the blitz playoff over David Xiao, though both are officially co-Champions. Yesun Lee of Weibel Elementary (below) meanwhile dominated the Under 12 Girls section, winning 5.5 out of 6, and giving up a draw only to the higher-ranked Allyson Wong of arch-rival Mission San Jose. In the Under 10 Boys, Jacob Chiang and top-seeded Shawnak Shivakumar tied with 5-1 records. In the blitz tiebreak, however, the higher-rated player’s experience emerged, and Shivakumar took the first place trophy home. The Under 10 Girls featured a three-way tie at 4.5 by, in tiebreak order, Kally Wen, Anika Rajaram, and Ramya Elangovan. In the Under 8 Boys, Rohan Rajaram won first with a 5.5-0.5 record, while in the Under 8 Girls, Anvi Penagalapati took home first place after winning the playoff over Ananya Acharya. In the K-8 Under 800 section, top-seeded Jon Cendejas won with a perfect 5-0 record over 57 other players, while the 55-player K-4 Under 500 section was won by Arvin Agarwal with a 5-0 score. For school team competition, Weibel continued its momentum from the State Tournament by winning 4 team titles, followed by cross-town rival Mission San Jose Elementary with 3. Fallon Middle School (coached by the author) won the 2 remaining sections. 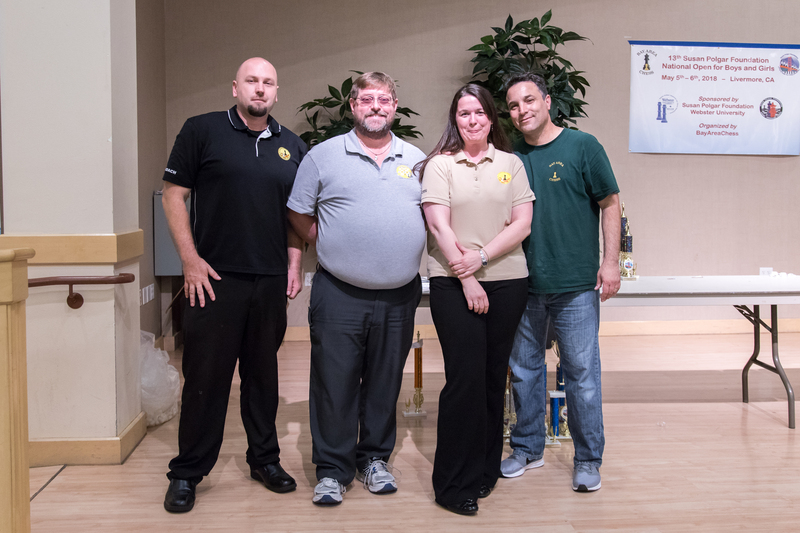 In the Club team competition, BayAreaChess won 4 sections, followed by Liu Chess Club, NorCal House of Chess, and Bright Chess Club, each with 2. 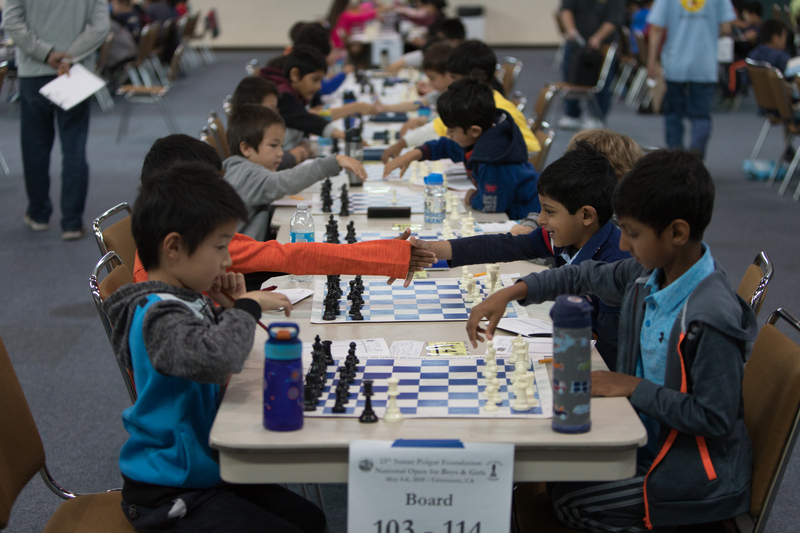 The Blitz tournaments were won by Manas Manu of Monta Vista High School (open section) and Eric Yuhan Li (Grade 4 and under). The tournament organizer, Dr. Judit Sztaray, thanked the strong crew managing and directing the tournament, led by National TD John McCumiskey, National TD Tom Langland (above, with BAC Coach James Bethany and Sztaray), and the many volunteers and staff who worked hard over the weekend to make sure the event was safe, fair and fun for the kids and parents. 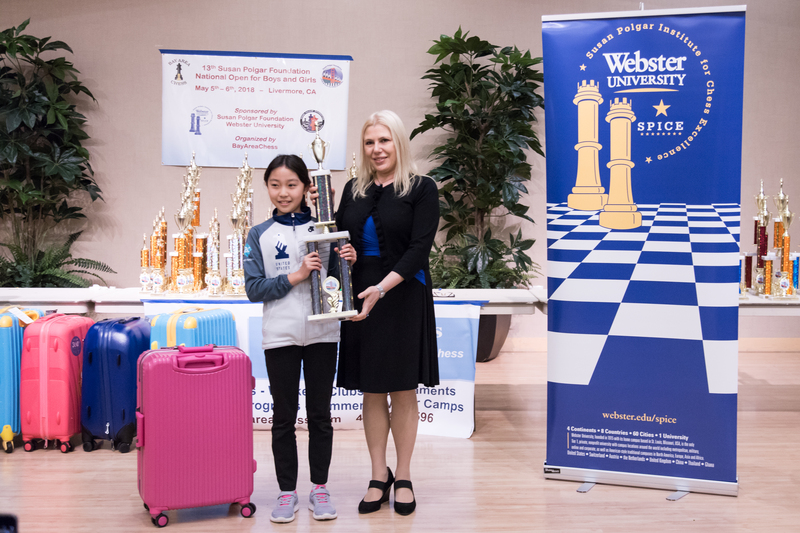 She also thanked GM Susan Polgar and her manager and husband, Paul Truong, for making the trip from Saint Louis and being available for the many questions, pictures and autographs. Links to all the individual and team results and photos are here.